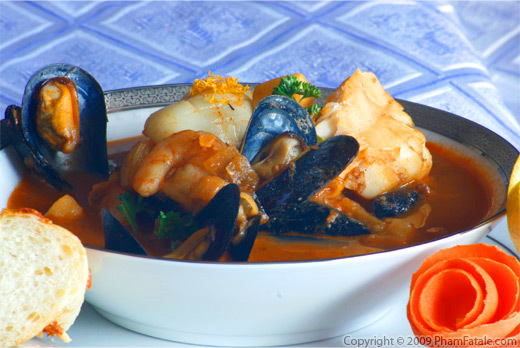 Can chua cá literally means sour fish soup in Vietnamese.The composition of the soup is the Vietnamese equivalent of tom yum Thai soup. The sour flavor is from the kaffir lime leaf and tamarind powder and the sweetness is from the crushed pineapple. Recently, I made this soup for our dinner guests. I served it with a side bowl of steamed jasmine rice. At the end of the meal, I was surprised to see all the bowls completely empty, given that the flavors are somewhat unusual. But they seemed to love it, so I'm guessing you might as well. Peel the pineapples. Slice into 1-inch chunks. In a food processor, blend one pineapple into a fine puree. Add about 2 tablespoons of water if necessary to get a smoother flow. Keep the second pineapple as is. Set aside. Slice the bạc hà into thin pieces, cutting on the bias. Set aside. Wash the lemongrass; cut each stalk into 2-inch pieces and bruise the pieces with a hammer. In a 5-quart stockpot, bring 1-1/4 quarts of water and the vegetable broth to a boil. Add the kaffir lime, black peppercorns, pineapple puree and lemongrass. Cook for 30 minutes. Strain in a sieve. Discard the aromatics but keep one stalk of lemongrass and a few kaffir lime leaves for presentation in your soup tureen at the end. Pour the strained broth back into the stock pot. In a small pan, heat 2 teaspoons of oil and add the straw mushrooms. Cook for about 2-3 minutes, then add the enoki mushrooms. Transfer to a plate and set aside. In the same pan, add the rest of the oil, add the chopped garlic and the chili pieces. Cook until slightly golden. Add the tom yum paste (click on the link for the recipe) and a ladle-ful of the broth. Pour all the contents of the saucepan into the big stock pot. The broth should be fragrant and properly seasoned. Check for the sourness of the broth. Add the tamarind powder. Taste. Add the salt. Taste. Then finish with the sugar if necessary. The secret is to balance the sweetness and the saltiness. Be sure not to oversalt! Bring the soup back to a boil then add all the mushrooms,okra (if using), tomatoes and bạc hà. After adding the ingredients, the broth may cool a bit. Let it come back to a boil for a last time, then add the fish. Cover for 5-8 minutes, then remove the pot from the stove. Garnish with some ngò gai and ngò om. Add nước mắm (fish sauce) if necessary. It's ready! Serve immediately. Accompany the soup with a bowl of steamed jasmine rice. Each person spoons some rice into the bowl of canh chua. The broth should be made in 3 steps, in this order, sour, salt and sweet. It's very important that you taste the broth at every single step to ensure a balance of flavors. My decision in making canh chua usually depends on how sweet the pineapples from the market are. The key to a good broth is to use 2 fresh whole pineapples, one for the broth and one for serving in the soup. Make sure they are naturally extremely sweet so you don't have to add much more sugar to the broth. I usually add brown sugar or palm sugar to the broth if the pineapple isn't quite sweet enough. If you red snapper isn't available, you can substitute another white fish like catfish. You may never have heard of bạc hà before. It's the stem of the taro, a celery looking vegetable that has an inside similar to a sponge. It brings texture to the soup and absorbs all the flavors of the broth.You can find it in most Asian stores in downtown San Jose, California but if you can't find any, you can substitute a celery stalk, even though the texture is different. Ngò gai, literally spiky herb in Vietnamese, is a strong cilantro-flavored herb that is traditionally served in the can chu soup. It's a love-it or hate-it kind of herb. My hubby Lulu is not a big fan of it, so I usually make a special bowl for him with finely chopped cilantro. Ngò om is a rice paddy herb that brings a lemon and cumin flavor to the soup. You can find both ngò gai and ngò om in most Asian stores. I didn't make the canh chua broth the traditional way. Usually it is made with fish stock which involves a lot of fish heads. I make it this way for 2 reasons: first, I'm a little squeamish at the idea of working with fish heads and secondly, I make a vegetarian broth so that the whole family gets to enjoy the soup. Red snapper fillets and shrimp are added at the end. It is as delicious. With shrimp, it's called canh chua tôm. For the shrimp, lightly saute for 1-2 minutes 1 dozen shelled and de-veined shrimp in garlic (do NOT overcook) in small pan. Add about a ladle of broth. Set aside until you're ready to serve. If, like me, you're cooking for vegetarians as well, divide the broth into 2 pots and add the shrimp and fish to one of the pots. Add the combination of shrimp and fish to the broth at the last minute. Cover for 5-8 minutes and it's ready. Spoon the shrimp and flaky fish into each serving bowl. For the veggie version, add fried tofu cubes. We're very lucky to get the kaffir lime leaves from my garden. It's very useful and smells so nice. If you have the space to plant a kaffir lime tree, go for it, it's a good investment if you're into Asian cooking. Lulu started to grow lemongrass last year for me. The stalks are slowly growing. I'm ecstatic about it because lemongrass tends to be (I think) pricey. Oh, did you know it's a great mosquito repellent? Published By: Jacqueline Pham on June 5, 2009. 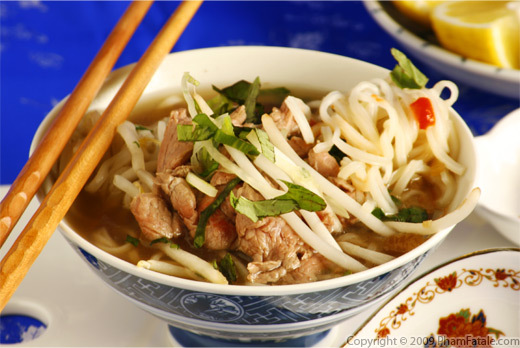 I love Vietnamese cuisine, in fact i have a great Asian cookbook,and sometimes and when i find all ingredients I love to try some new Vietnamese recipes, and I love your recipeAn thanks for your explanations are very useful for me . now I just need to get back to Hawai'i with some fresh fish from Alaska. Looks so good! I tried making a dish once that called for kaffir lime leaves & couldn't find them anywhere! Suggestions? Not surprised your guests loved it...looks fantastic! 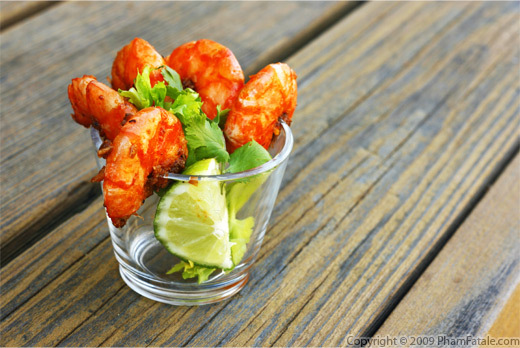 We love to make it w/ prawns. Looks great! Minus the fish of course, for me. This got me thinking... do you know the name of (or have a recipe on this blog for) Thai soup with lemongrass and mushrooms? I had it in a restaurant the other day, and I want badly to make it at home, but I forgot the name!! This soup is strikingly gorgeous...I'll look for it next time I go out for Vietnamese. This looks so unique and delicious! I love the addition of pineapple, don't believe I've ever had it in soup before. @Cheffresco: You're right. I use kaffir lime leaves when I make Tom-Yum Thai soup. The most important part of the kaffir lime leaf is the fragrance. You can find kaffir lime leaves in some Asian stores like Korean markets or online (click on the link). If you cannot find any, my suggestion is to balance the sour flavor with lime juice even the taste isn't quite the same. @Hong from RavenousCouple: if you can make canh chua tôm, make sure to keep the tails of the shrimp for a nice presentation. @Matt from No Meat Athlete: The broth is vegetarian, so no worries. 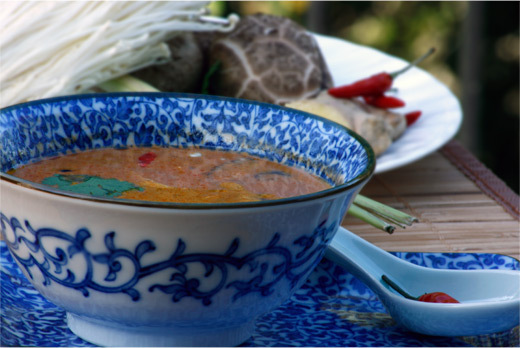 The Thai soup you're referring to is available on this link. @working mom: It seems like a long recipe but it's not. It's just a whole long list of ingredients. You'd be surprised how fast it takes. If, unfortunately, you can't find all the ingredients, you can replace the bac ha with celery stalk, kaffir lim with lime juice, ngo gai and ngo om with fresh cilantro. @Sara: Pineapple puree brings an interesting seet and sour flavor to the broth. It's very different from other soups. Just got on your Blog and I love it! Brilliant pictures and the food looks fantastic. Hove been a few time to HCMC and ate my way trough Saigon! Will place your site in my Blogroll so I will return and see what you are cooking next. This is one of my favorite soups. I often order it at my favorite Vietnamese restaurant. I love the tangy edge that it has. Really wakes up the ol' taste buds. Lovely food, Jackie! I love lemon grass, lime leaves & tamarinde! Yummie & healthy too! I bet the steamed rice would work well with the flavours of this dish,....MMMMMM...!! 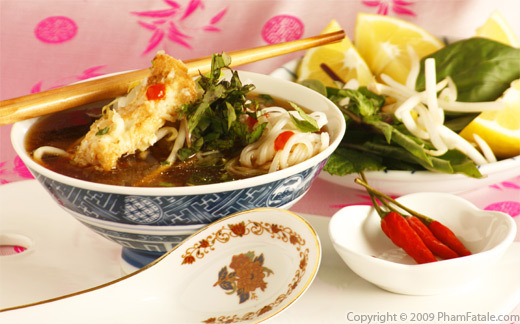 This soup looks delicious - I had something similar when I was in Asia last year and LOVED it! salt? wheres the fish sauce!? Nước mắm is the fish sauce. I do not add it to the broth because I find it a bit strong (and not suitable for the vegetarians in the house). I only add some fish sauce at the end when serving. I love bac ha. That's the whole point of making canh chua for me. Not sure where to buy the plant. You could ask where your Asian grocery store gets their plants and call the farmer directly? Or ask at an Asian nursery? Heck, go for using the fish heads next time! It shows that you don't waste food. mmmm mmmm good! Toi rat thich mon nay, nhung nau theo cach mien tay ngon hon. Cach nay chi gianh cho nha hang. This is my absolute favorite dish! There is a place down the road from my work that serves it with "shrimp balls" instead of fish. It's absolutely amazing! Can't wait to give this recipe a try.